Dexter Daily: Michael C. Hall on Dexter Season 7 & Final Season: "I Imagine a Shakespearean Tragedy Ending"
Michael C. Hall on Dexter Season 7 & Final Season: "I Imagine a Shakespearean Tragedy Ending"
Read below a great new interview with Michael C. Hall, on Crave Online. He talks about the current season, the final season of Dexter and many more. Did you know that Debra would eventually learn about Dexter’s Dark Passenger years ago? We see her come into an awareness of some sort of deeper more conflict-laden feelings for him but I think it’s undeniable to him that he has a genuine connection to her and that he does genuinely care about her, and care about her and other people close to him, namely his son, in ways that he can’t deny, and yet he does maintain an allegiance to his compulsion. It’s bananas. Jennifer and I have really enjoyed playing this new dynamic. It feels really fresh. Does that mean the romantic undertones between them that were suggested last season are really over? What did you think when you read that development last season, exploring romantic feelings for an adopted brother? Michael C. Hall: I think she’s someone who’s been looking for answers to maybe questions that she hasn’t even been able to quite ask. In a way I think whatever feelings she came into awareness of, you could argue that they had something to do with those unanswered questions, questions that have been answered this season. Certainly her feelings about her brother are going to change a bit now that she knows what she knows. Did it also occur to you that it could be taboo, even with an adoptive sibling relationship? Michael C. Hall: Sure, but I don't think we’re doing a show that’s really shied away from taboos. It’s sort of a taboo to begin with. When you passed the five year mark, which is the run you had on “Six Feet Under,” how did it feel to be in a sixth and seventh season of a show? Michael C. Hall: I don't know, sort of beyond anything I ever imagined for the show. I finished “Six Feet Under” and when we started “Dexter” thought, “Well, if we manage to do it that long, that will be remarkable” and we’re beyond that. It seems in a way like a smaller amount of time somehow. Time expands and compresses in your mind and your memory, but I’m just really thankful to, in the seventh season, feel like we’re genuinely breaking new ground with the show and with the characters. Showtime’s already talking about leaving it open past season eight. Do you think there’s a definitive end next season? It’s a difficult thing to say anything beyond the shadow of a doubt but all signs point to the final episode of the eighth season being the final episode of the show. 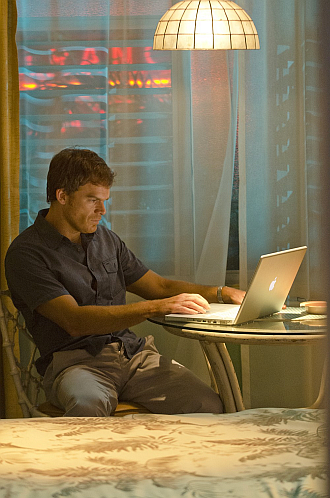 How did you feel about Dexter being outed by Deb? Well, thankfully she hasn’t outed me yet. I’ve only been outed to her, but it’s horrifying for him. I think it’s interesting to see him forced to defend himself to a degree, and I think he maybe makes some sort of hedging apology for putting her in an awkward situation but he never apologizes to himself or to her for what he’s done. He’s totally ready to defend himself, justify what he’s done and what he plans to continue to do and I think that’s really interesting. It’s certainly an interesting thing I think for Jennifer to play. Dexter over the course of the life of this show has been initially someone who claims to be without the capacity for authentic human emotion. We’re meant to be suspicious of that. He comes to be suspicious of that. Certainly he plays at, if doesn’t genuinely experience what it is to be human in different ways, more sophisticated ways, more emotional ways. I don't think it fully resonates with him just what a burden it is for her, but I think his journey is at least in part you see him defending himself in a way that he never has had to do before. And he never apologizes for what he’s done and what I think we can reasonably expect will continue to do. He has a sense of righteousness about who he is and how he’s managed it and what he does. Was there a lot of discussion about Dexter so quickly acknowledging who he is and what he’s done after Deb caught him? I think given what she sees at the end of the season six finale, it’s difficult for him to wish that away. Once she, at the end of that first episode [this season], finds all that evidence, in a split second he’s presented with two potential problems: to try to deny the undeniable or to try to manage it and fess up. I think he in that split second says, “Yes, I am.” You see him almost immediately in the second episode go about dealing with that new reality. Start a strawberry farm. No, I don't know. I didn’t know that “Dexter” was on my horizon. I couldn’t have imagined it so I would hope that several years from now I will have taken part in something that I couldn’t yet imagine right now. Why was this season’s case a good fit for what’s going on with Dexter and Deb? I think the show is always at its best when Dexter’s in trouble and in hot water. I think he’s in hot water on so many fronts this year. He’s certainly in hot water with his sister and therefore in hot water with his job and with the police department and even hot water with Ray Stevenson’s character. He’s in increasingly hot water with Yvonne Strahovski’s character. He seems to attract chaos. He can’t help it. The interesting thing is what’s gotten Dexter in trouble has not been his dark passenger or the fact that he kills people. It’s been that he has this appetite for a connection with these people. That’s what’s gotten him burned and what’s burned the people he loves, whether it’s Rita getting killed or his sister finding out. It’s had to do with him indulging in human interactions, not indulging his compulsion to kill. So I think what’s happened with Deb will probably recommit him to a stricter adherence to the code. Season Four was so monumental with John Lithgow. Do you feel like subsequent seasons you’ve been chasing that high watermark? Certainly in terms of a foe. John Lithgow, first him as an actor and as a performer are a factor, but also the character he played was the most prolific serial killer [and most] formidable opponent that Dexter had faced and probably ever will. So I don't think we’re quite going to match that, but I honestly feel that the season we’re doing now feels so much like a culmination, it’s so completely served by all the water that’s under the bridge and all the story that we’ve told up to this point that it feels as weighty as anything we’ve done. Do you miss Melissa Rosenberg and Clyde Phillips? Sure. We have an incredible room of writers and there’s always been a degree of turnover that’s happened on the show. We’ve had amazing people come and go but their writing remains on the wall. I think the work that they did is something that’s appreciated and incorporated by the writers who were there when they were there and who remain. After doing an HBO series and a Showtime show, do you think you could do a network show? I don't know if I have the endurance to do more than 12. What do you find most surprising about Dexter? I think what surprises me is that he’s evolved in the way he has. The character Dexter is now... or the landscape of the show is beyond anything I think I would’ve imagined when I was shooting the pilot episode. I think it’s been a pleasant surprise that we have writers who are able to back themselves into corners and then write themselves out of them and I’m thankful for that. I think the expansiveness of it and of the world we’ve created and the fact that it does sustain a lot of seemingly unsustainable things. The fact that he got married, that he’s had a kid, that his wife was murdered, that he had a romance. None of those things felt like they could justifiably be in the cards when we started but we’ve managed to do it. If you controlled everything, how would you like to see him conclude? Do you talk about the ending of the series now? We do. I think up in the writer’s room, especially because we’re going to go back to shooting the final season in February, we’re not going to wait as long. So they’re already talking about it’s going to get nailed down one way or the other, but nothing is yet set in stone and I’m sure it will be in somewhat a state of flux until the final day. Could it end with both Dexter and Deb surviving? Well, it could. I don't know. I imagine it ending like a Shakespearean tragedy, pretty high body count. You don’t really imagine him being alive at the end, do you? Yeah, I can imagine him being alive, but not walking off into the sunset. Maybe alive living at the bottom of a well or something. Have you become a little bit more like Dexter, adopting his mannerisms over the years? I never wake up and wonder who I am, I don't think. Only when I really put him to bed will I begin to appreciate just how much I’ve taken him on or he’s affected me. I think when you play a character this long, you start to know it on a cellular level. In a way, the job becomes different from what it initially is or what any acting job initially is. There’s a part of it that’s about getting out of its way and just letting it happen because a part of you knows just instinctually how it should be played. Yeah, the fact that the writers know me and know all of us I think inevitably, as actors, as people, they write for us and with us in mind. What about in everyday life? Michael C. Hall: I don't know, maybe I’m more relaxed for having exorcised my demons at work.